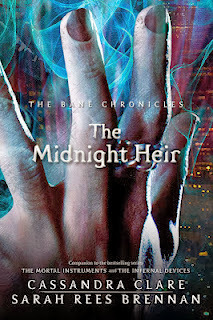 I love the Bane Chronicles and how Magnus is often in a mess with the Herondales I've noticed. Edmund Herondale, Will Herondale, James Herondale, and Jace Herondale (aka LightWORM). Damn, he really likes the Herondales! Anyways it's fun meeting James. I feel sorry for him though. Oh my gosh. When I started reading this and James entered the story I was like AHH! but there was no noise coming out so I just sat there in the nurse's office with my buddy with my mouth hanging open and she was like "What is wrong with you?" Anyways, and then Tessa came in and I was practically bouncing up and down in my chair cause I knew then Will would have to join and I so wanted to see Will in all his beauty! But when Will actually did join I wasn't prepared. I put my ipad down and was squealing and laughing and tearing up because I missed him so much. When I finally calmed down I looked over to my friend and was like, "I can't read this anymore. It's just too much." And she said, "It's okay Samantha, you'll get through it word by word." And she was right cause soon after I picked up my ipad and continued reading. Then Brother Zacharia joined. And I was filled with so much joy! But I felt awful for poor James. So I continued reading. Anyways, I have to thank Cassandra for being an amazing author and writing this particular book! I'm so glad she was able to weave Will, Tessa, and Jem into it. It just makes me so happy! Though I do think it ended quite terribly. I do wish that Tessa and Will taught James how to prepare for the cruelty that love could bring instead of simply teaching him of the beauty. Because now poor James has to suffer. I hate you GRACE! Anyways I really loved this story. It was utterly beautiful. 5/5. What makes this book different from all others? And why should anyone care? This book is different because it's another Shadowhunter book I know. I know. That makes it sound insignificant and unordinary. But trust me it is different. It just is! Plus you should all care for the sake of Herondales. THE HERONDALES! Did this book meet my high expectations? Oh definitely. It did that once Tessa, Will, and Jem entered it. It surpassed with the whole Grace thing and James and Magnus and uh! I can't really explain it without giving away the book. Nevertheless it did. Would I recommend this book and to who? Yes! To all my fellow shadowhunters and those who like fantasy and demons and angels and nephilim and warlocks and that sort of thing. P.S. I'm doing this bucket list thing because I'm moving. Check it out here: http://beach-ee.tumblr.com/pre-moving_bucket_list Please let me know if you come up with any ideas for me to add onto it. :D Thanks! Man, I really need to get up to date on my Cassandra Clare series', everyone is going along without me and I keep bumping into reviews I should be posting myself! Haha you should. I'm gonna read the Infernal Devices mangas next. x) I hate bumping into reviews of books that I want to post myself. It annoys me so much that they post it instead of me!